Are you ready to indulge yourself with good food? House can’t wait to share their new punchy flavour items with you! Broccoli , Quinoa & Pom Pom Salad [$18] Gluten Free Must try! Started off our meal with a bang! This is indeed an awesome plate of salad ,with their own house mix of super leaves, nuts and sprouts, tossed with quinoa, crunchy sprouted broccoli and aromatic coriander. Mix with an enticing pomegranate raita, it pulls it all together. I am a meat lover, but I love this dish. Bacon & Egg in a Naan Jam [$22] Using the best Demerara brown sugar, the candied bacon together with a runny sunny side up egg are dressed it all up in a grilled naan roll. Comes with spicy tomato jam and cream cheese, this is a perfect dish. Baked Scallops on Shell [$24] Seared Hokkaido scallops spiced up Mediterranean egg plant Zealous, and baked on their shells with crumbly Spanish Migas on top. An interesting dish that you got to try! Portobello Schnitzel Bun [$28] **Vegetarian** Must Try! “Schnitzel” that made up of breaded Portobello and Provolone, tuck between a Tiong Bahru Bakery Arugula bun, mint and apple green slaw, pickled cucumber and a spicy mayo. Comes with sweet potato nibblets. 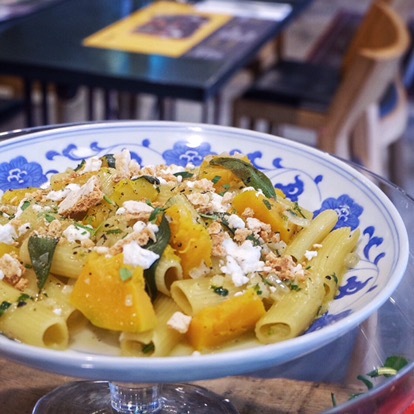 Baked Pumpkin & Goat’s Cheese Rigatoni[$23] **Vegetarian** Rigatoni pasta is sautéed with sweet pumpkin and fresh sage leaves,crumbled over with goat’s cheese and almond amaretti. This dish seems to be normal compared to other dishes. However, still an option for vegetarian! Bone Marrow & Steak Burger with Bacon Jam[$29] House original burger patty with added bone marrow between brioche buns with fried onion rings,cabbage,Provolone cheese, spicy mayo and bacon jam. Served with sweet potato nibblets too. Burger patty is too thick and a little dry for consumption. Stinky Meets Crispy Chicken Waffles[$24] Must Try! Crispy Har Cheong Gai chicken atop rice flour waffles and drizzled with terrific sambal maple syrup. 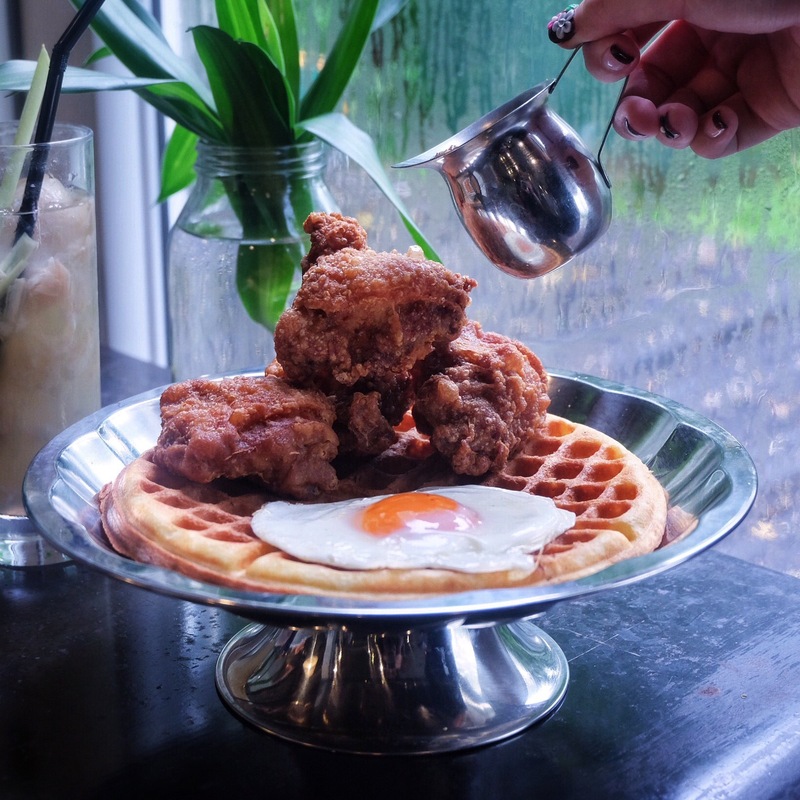 Chicken is crispy and tender while the waffle is a little hard like a waffle biscuit. Well, I don’t mind to order this dish for proteins over carbs! Try it!